Whether you are planning a long vacation or a lengthy road trip, you’ll need to plan your food. I talk about how to store your foods, and share some tips and tricks to help you preserve your food while traveling. This post was sponsored by Canyon Bakehouse. I was compensated for my time. Opinions are my own. We just returned from a two week camping trip. This is the longest we’ve camped, and the food part was almost 100% us making our own food. Because the places we traveled didn’t have a lot of gluten-free restaurant or bakery options, we had to plan our meals in advance, do prep work, decide when to stop for groceries, and preserve the foods we brought with us. 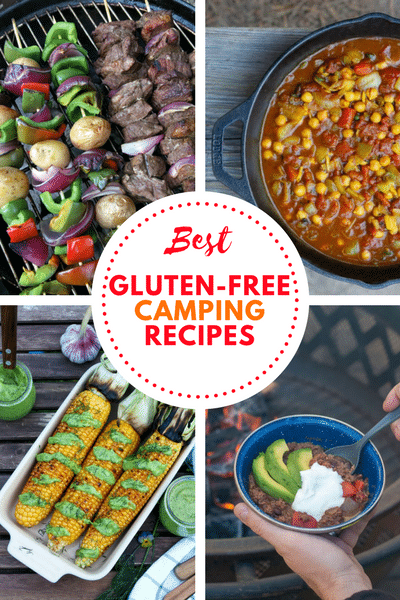 I wrote a post on gluten-free camping foods that includes some recipes but really what I want you to know is that we like to make the same foods camping that we would make at home. Add in the occasional hot dog and s’more and you are camping ready. The hardest part about traveling or camping that long is the food planning, in my opinion. We knew there wouldn’t be a lot of options to eat out where we traveled to and most stores are hit and miss on what gluten-free products they offer. First we sat down and planned all of our meals. I know that sounds daunting, but its important and you know exactly what you need to bring with you and what you need to pick up at the grocery story. After we planned our meals I wrote down a grocery list of everything we would need in order to make the meals on the list. After we had our menu and our grocery list I bucketed the foods into categories: Perishable, Non-Perishable, Easy to find in grocery stores (like gluten-free tortillas, fruit, meat, etc. ), and hard to find. Anything that was non-perishable that was hard to find was on the list to pack in the car before we left. 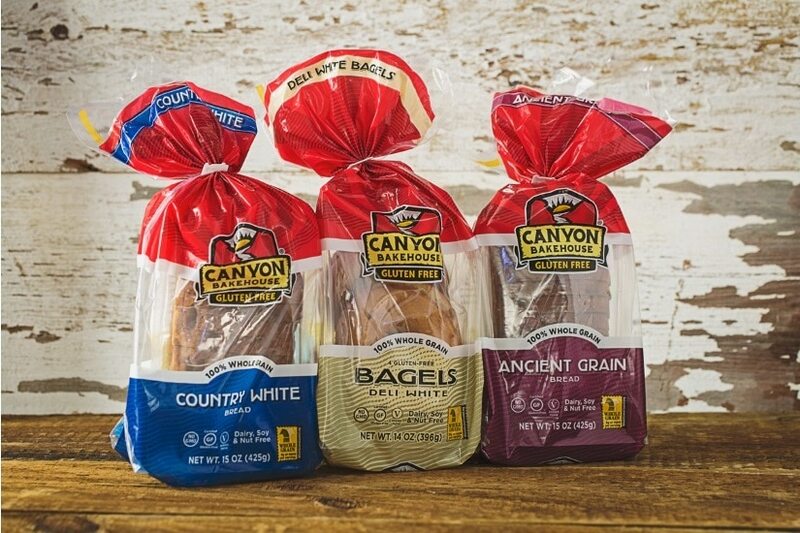 Canyon Bakehouse came out with “stay fresh packaging” this year and it’s been a huge saver at home and while we were camping. Their stay-fresh packaging is a new air-tight package that keeps loaves fresh (when secure in their sealed package) for up to 90 days after they are packed at their bakery. Perfect for long trips and camping, right? 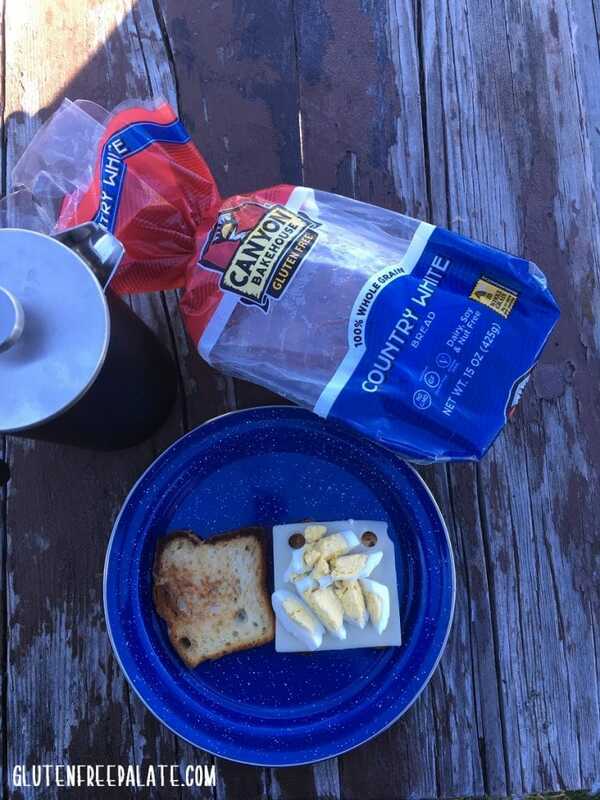 We brought six loaves of their stay fresh bread with us camping and had fresh bread throughout our trip. I precooked the first few meals we had planned to eat and froze them in advance of our trip. They stayed frozen in the cooler, and helped keep the other foods cold. When I was ready to use them I moved them to the top of the cooler to defrost. 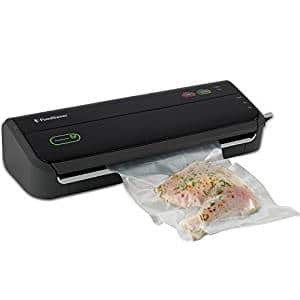 I also used my food saver (affiliate link) for lunch meats, sliced fruit, and anything else that would normally spoil in a day or two. A food saver vacuums the air out and helps keep things fresh longer. Using a food saver added 2-3 days of use to the foods that I vacuum packed. Like I mentioned above, we packed as many of our non-perishable favorites for our trip in case we couldn’t find them. We only stopped at the grocery store every 4 days or so in order to pick up fresh produce, meat, and anything else that we may have forgotten. Do you go on long trips, camping trips, or road trips? When you do, what do you do for food prep? Do you plan your meals ahead of time? Leave me a comment below and let me know! 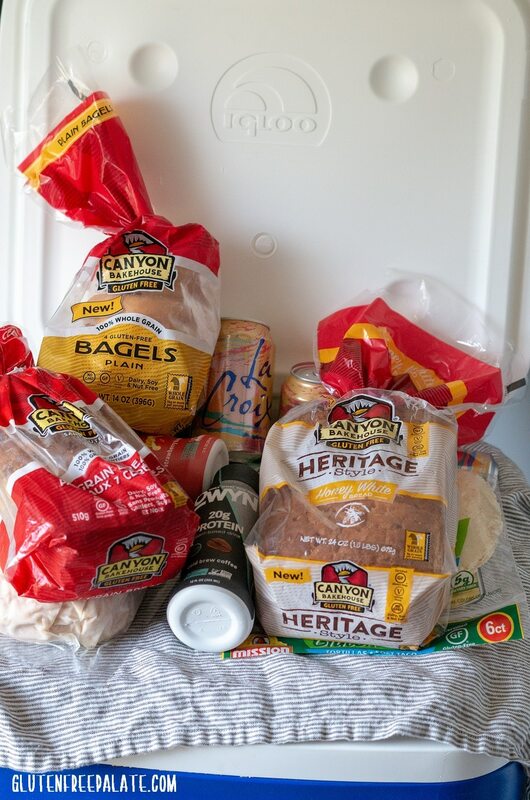 If you like planning trips, road trips, or camping you might want to check out my gluten-free camping foods post and my gluten-free road trips post.